Color Street is one of the newest beauty companies to hit the scene with their popular and globally patented nail polish wraps that require no UV, heat, or dry time. To learn more about Color Street Nail Polish Wraps, then read this article. Circle City Tips sent this product to the author of LeeNG Beauty for free. All opinions are the author’s own. Circle City Tips is an independent contractor and cannot speak on behalf of Color Street. Having just launched in June, Color Street is one of the newest direct sale beauty companies growing in popularity for their nail polish wraps. What’s so special about them? Their globally patented design. Color Street Nail Polish Wraps are composed of ninety-five percent pre-dried nail polish that can stretch to fit your nails. There’s no dry time nor heat needed and each wrap contains a base, color, and top coat all-in-one! They look good for up to fourteen days and can be removed with nail polish remover. 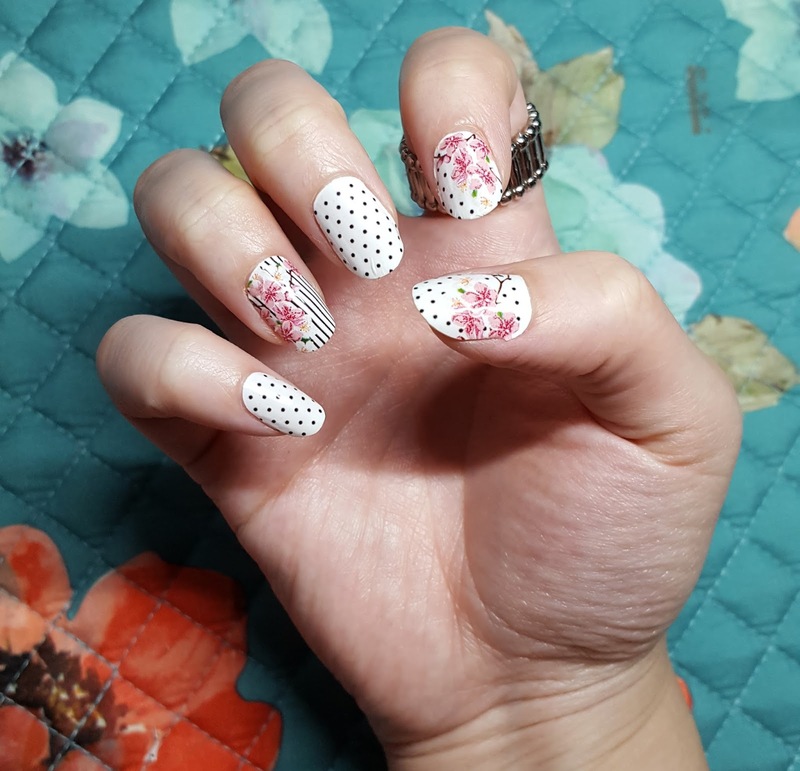 Their nail wraps are offered in four main styles - nail art, glitter, solid, and French tips — with each having lots of designs to choose from. Less than a week ago, Color Street had launched their holiday collection selling out that same day (but has been restocked). Depending on the style you want, the nail wraps can range from $11.00 to $14.00 USD in cost, but they do run specials here and there. Elizabeth Christian of Circle City Tips, a consultant for Color Street, had sent me a set of wraps called 'Sakura Festival' to try out. 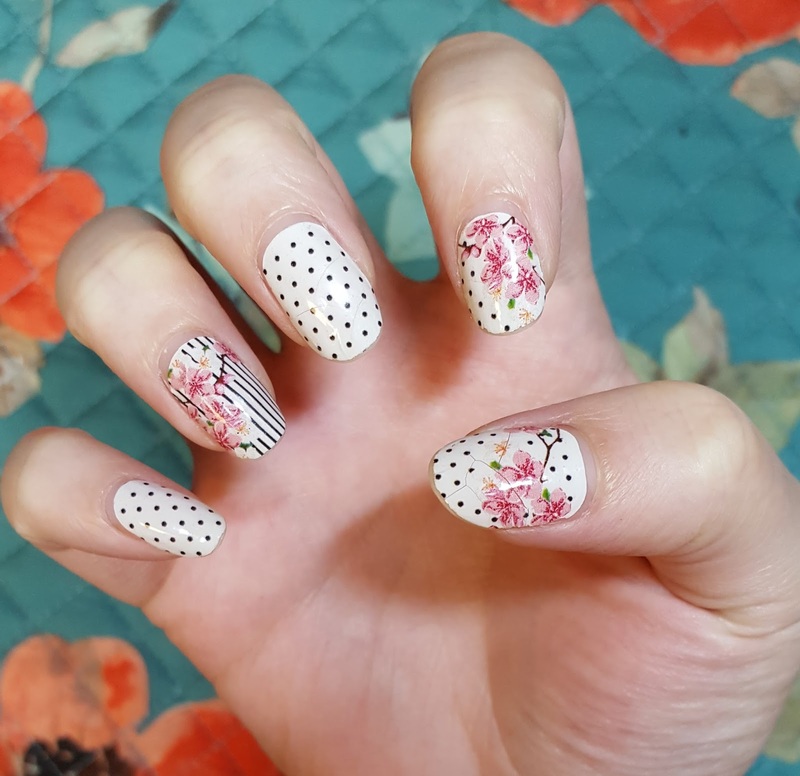 These are a black-and-white nail art option with polka dots, stripes, and cherry blossoms. Generally, I’m not that into nail designs, but I’m a sucker for anything covered in flowers and I'm impressed by how well they held up. After two weeks, you can see that there’s a little wear on the tips and cracks in the finish. The cracking is because my nails are so flexible and flimsy that it can reduce the integrity of the nail polish wrap (and most other nail products...) with the almost minimal force it takes to bend my nails. Most people will not encounter this issue. Aside from that, it's still intact and still looks as good as it did on day one. You know what my regular polish would’ve looked in two weeks? Dull (even with top-coat), beat-up, and crumbling. 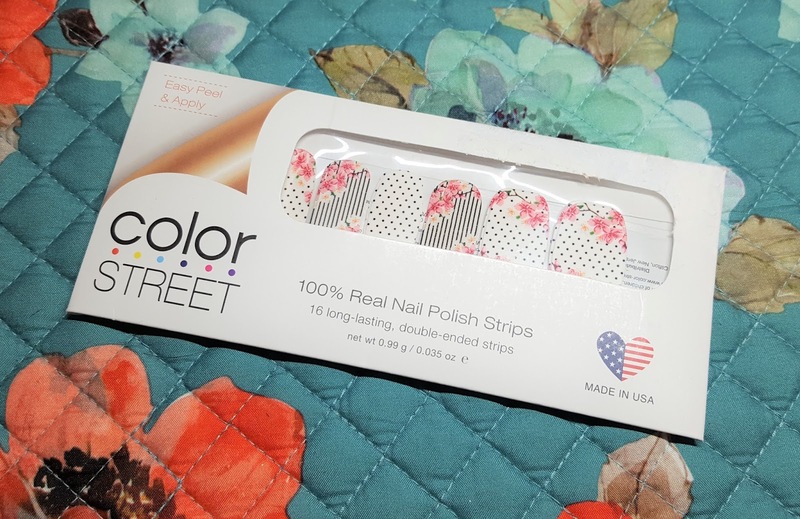 Before using Color Street, I hated using nail wraps as the ones I’ve used were practically cheap stickers. They fray horribly and even if you use heat, they'll lift and fall off after a couple of days. With Color Street, once they're on, they stay on and don’t fray when you file away excess. 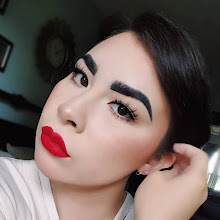 You might get some overlapping and creases the first couple times, but nothing a little practice can’t fix, and the application is pretty easy. Each set of nail wraps come in an envelope that also includes two alcohol wipes and a small nail file, which is all you need. You wipe your nails clean with the alcohol wipe to remove the natural oils your skin produces, and the file is to shape the wrap to the nail. 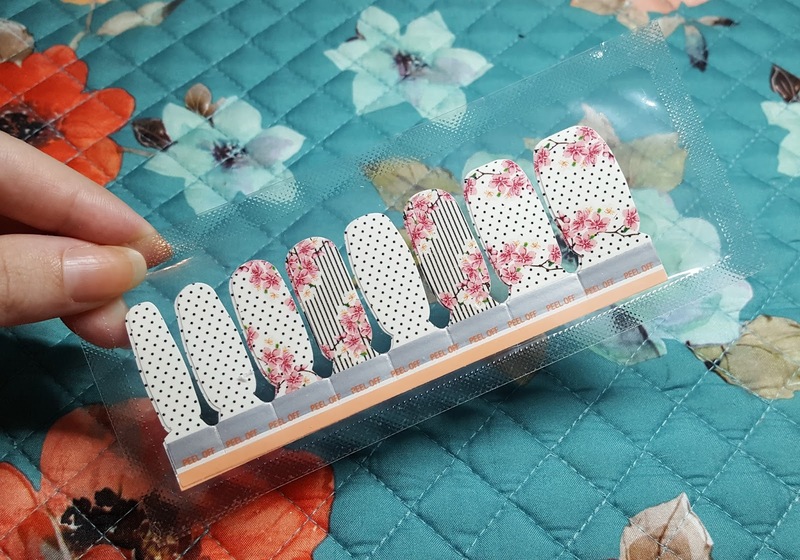 Color Street Nail Polish Wraps come in a sealed, plastic packet to keep the adhesive from drying out. Once you break the seal, you need to apply within an hour before they dry out. Depending on how practiced you are with nails, they can be applied in as little as ten minutes - I did mine in about fifteen. They’re a one-time use product, but some have had success in re-sealing the packet with a flat iron to save any unused wraps for later. If you’re interested in purchasing Color Street Nail Polish Wraps, you can order from the Circle City Tips website or email Elizabeth at circlecitytips@gmail.com. Circle City Tips also has a Facebook Group you can join for the latest updates on stock and specials. And you can also head over to the Direct Sales Directory page to see if there’s a trusted consultant near you. 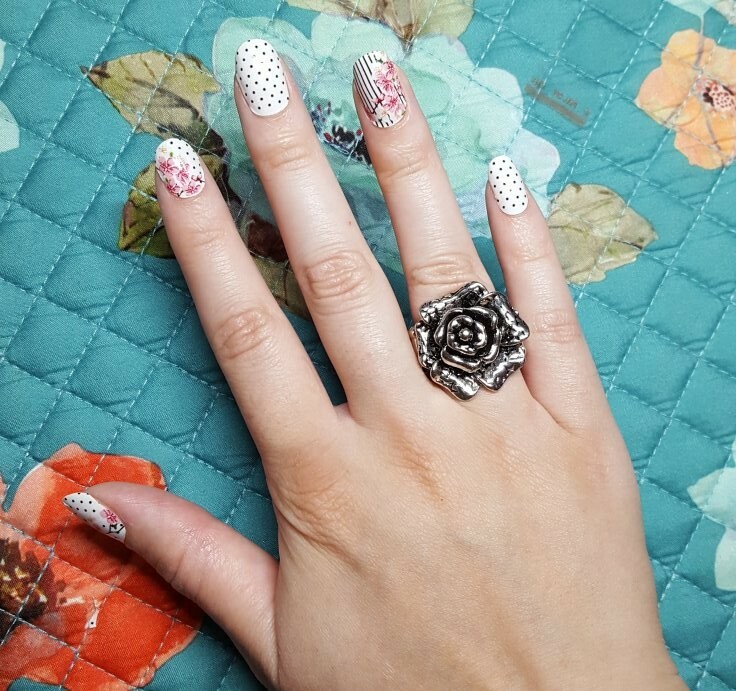 What are your favorite nail designs to wear? Comment Below.